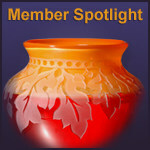 I am a sixty-something retired skilled trades auto worker who began creating in glass in the late 1970s. In 1999 my love of color and hot glass led me to return to school at College for Creative Studies in Detroit, MI to obtain a Bachelor of Fine Arts Degree with a major in glass. It is amazing that something as ordinary as sand and heat can be turned into great art. Everywhere you look around you in contemporary life there is glass, in windows, light bulbs, insulation, computer screens and TVs. I design my work to be colorful. My motivation is to make others happy or put a smile on their face. Glass art is created through the trial and error process. The focus and intensity of the process are demanding as are the high heat levels. The slightest laps in the intense concentration necessary to create in this art form can cause failure of all you hard work and effort. At times, glassblowing is a team sport. At other times it is an individual journey. Working with molten glass is an unbelievable thrill to those who have tried it or observed a glass blower at work. The thrill and beauty of making glass objects is unique. Each piece focuses on the visual depth as the glass reflects captures and magnifies light. After I retired from my “day job” in 2008 I was able to devote my time to finishing my degree. Since graduating in 2013, I have been able to work full-time at a local studio that is owned by one of the professors at College for Creative Studies. I am currently helping one of my classmates build our own studio. I have never been happier as I continue to explore the world of glass and seeing people appreciate my work. My current series of works have to deal with what expression, or gesture, might look like if frozen in time. 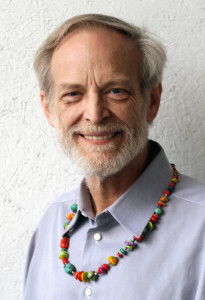 Check out David’s profile page on Michiganglass.org for samples of his art, contact information, and upcoming events. 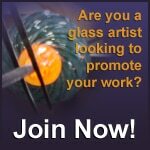 MichiganGlass.org is Michigan’s premier website and organization for anyone interested and involved with glass to find information on shows, events, lectures, classes, and everything glass. Copyright © 2018 Michigan Glass. Michigan Glass reserves the right to jury out any material that might be legally objectionable or of low design standards. Fees, less processing costs, will be refunded.